MGFB knows how to throw a great party! The Tallahassee Florida law firm of Metzger, Grossman, Furlow and Bayo, under the efficient coordination of firm administrator, Yolanda Boynton, hosted an elegant outdoor tented cocktail reception for 100 guests on Thursday evening June 26, 2008. 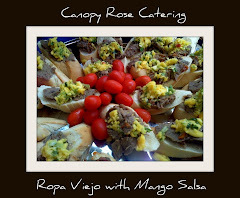 The Canopy Rose Culinary Arts Studio and Catering Company, from neighboring Havana, had the wonderful privilege of catering the food for this special occasion. 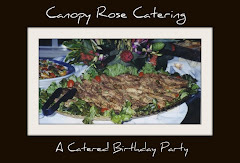 Canopy Rose caters corporate, legislative and philanthropic soirees, annual company holiday parties, Florida State University FSU Seminole / UF Gator pre-game tailgate parties, political fundraisers, victory celebrations, Gulf Coast seaside beach parties, wedding rehearsal dinners, wedding receptions, open houses, staff or volunteer appreciation events and, of course our mainstay, catered office luncheons. Do you have an event coming up in the Florida Capital Region, North Florida or South Georgia? 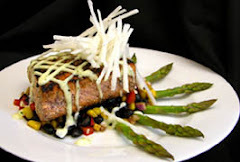 While we do not accept every job opportunity that comes along, we do accept creative catering and special event projects that are a good fit for all parties concerned where culinary and special event excellence pops with pizzazz. Our goal is to exceed expectations, dazzle tastebuds and facilitate our hosts and hostesses in creating a delicious and memorable event. 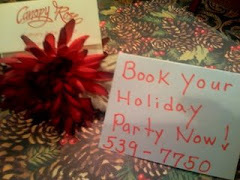 One of the highest compliments we receive is when our client and/or some of their guests book a future party with us. 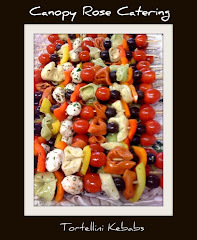 We were thrilled to be asked to cater the MGFB Christmas Party in December! 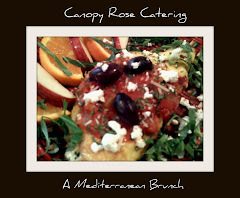 Canopy Rose custom- creates, cooks and caters corporate, legislative and social breakfasts, too! This fluffy station-cooked 2-egg omelet is enhanced with sun dried tomatoes, kalamata olives, chevre goat cheese and fresh herbs. To serve it we top it with a mildly spicy southwestern salsa. A chiffonade of collard greens brings it home and gives it a North Florida relevance. This delightful breakfast is served with fresh seasonal fruits and baskets of morning pastries. Everyone needs a secret resource for fabulous tasting party food. In the Tallahassee / Havana / North Florida / South Georgia / Gulf Coast Beach area... 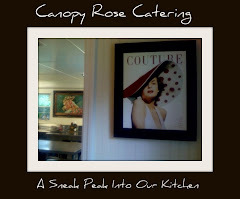 This secret resource is Canopy Rose. 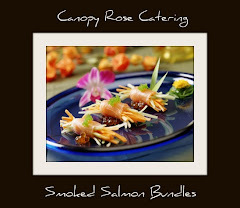 Canopy Rose Culinary Arts Studio and Catering Company creates innovative and classic favorites. 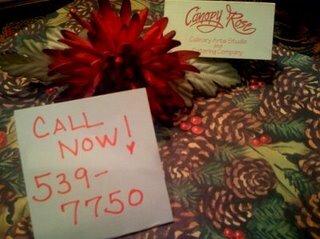 Whether you are in need of just a few spectacular gourmet treats or need to feed humdreds or thousands, Canopy Rose can help you! Razzle dazzle your guests with this classic, tried and true soiree. 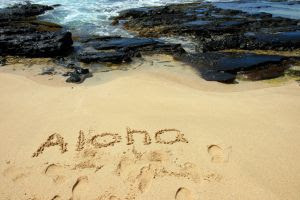 The tropical luau theme is perfect for " A Love Is In The Air" Engagement Party, A Fiftieth Wedding Anniversary, A Birthday Celebration or just about any festive special occasion! We begin this tropical luau with orchid leis, colossal coconut shrimp and a festive frozen drink station. Curious about what the inside looks like? In late 2007, we moved into our beautiful new headquarters in a quaint and historic old Tobacco town, minutes from Tallahassee, Florida. Many local area residents fondly remember this site as the home of the old Havana Bank. Present day visitors are awed by the presence of the amazing old bank safe, the mouthwatering aromas and the businesses unique concept. We are generally open by appointment only. The reason for this is that we are frequently engaged in catering, consulting or writing projects that require undivided attention. Periodically we swing open our doors for public cooking classes and special foodie events. Naturally, we would be happy to meet with you. 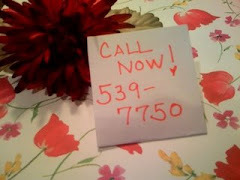 Please contact us in advance by phone at 850-539-7750 to schedule an appointment. Hillary and Briane of Monark Events in Destin, Florida performed an amazing party space transformation for this Moroccan themed soiree on Friday June 6, 2008 on the beautiful grounds at RedFish Village. This was the first time I've worked with Monark Events and I was very impressed with their creative attention to detail. It was also my first visit to RedFish Village. RedFish Village is a wonderful Gulf Coast retreat! 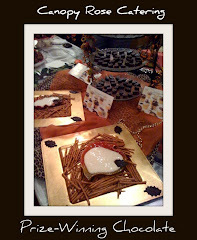 To gear up and get in the mood for theme cooking it is fun to stage a related event. 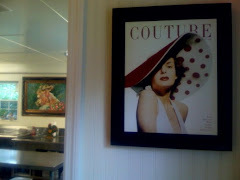 Several days prior to this event I threw a Casablanca Night For Two. From the Leon County Library, I checked out the Casablanca video. 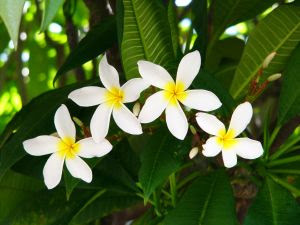 During the film, we dined on sweet and savory bites of Bisteya and a lovely mixed greens salad with spinach, kalamata olives, sun dried tomatoes, blue cheese crumbles and at the request of my guest, drizzles of the Canopy Rose Sweet and Jazzy Dressing. For dessert, we splurged on chocolate mocha tiramisu ice cream sundaes served in long-stemmed crystal goblets. 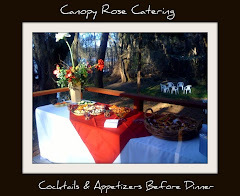 Canopy Rose is a regionally recognized, full-service catering company that serves Florida's Capitol Region, Greater Tallahassee, the Gulf Coast Beaches, North Florida and South Georgia. 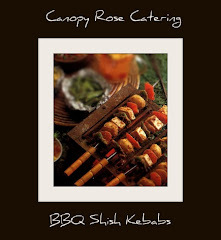 Founded in 1994, Canopy Rose became well-known for providing fresh innovative menus, beautiful presentations and outstanding customer service. 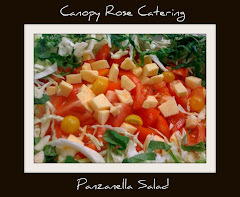 In 2008, a new Canopy Rose concept was launched when chef/ owner Kathi Dameron opened Canopy Rose Culinary Arts Studio and Catering Company in a historic Florida bank building. 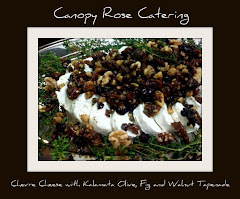 In addition to catering Canopy Rose offers an eclectic blend of cooking classes, food writing, food styling, culinary consulting, cookbook collaborations, team building events, food tourism and custom-designed culinary entertainment. There is special event design. Then there is culinary entertainment. 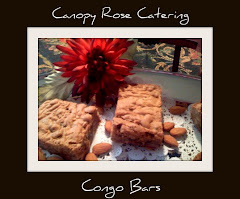 At Canopy Rose Culinary Arts Studio and Catering Company, we offer all three! 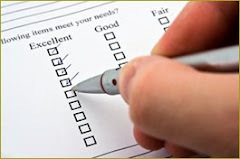 First let's look at your objectives for your event. 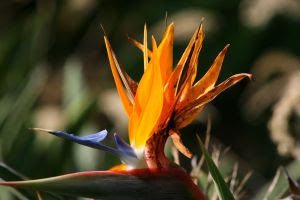 Once we have a clear vision of what you wish to accomplish and we believe that there is a compatible fit between your goals and our organizational mission, we can begin designing the most delicious program possible for you. 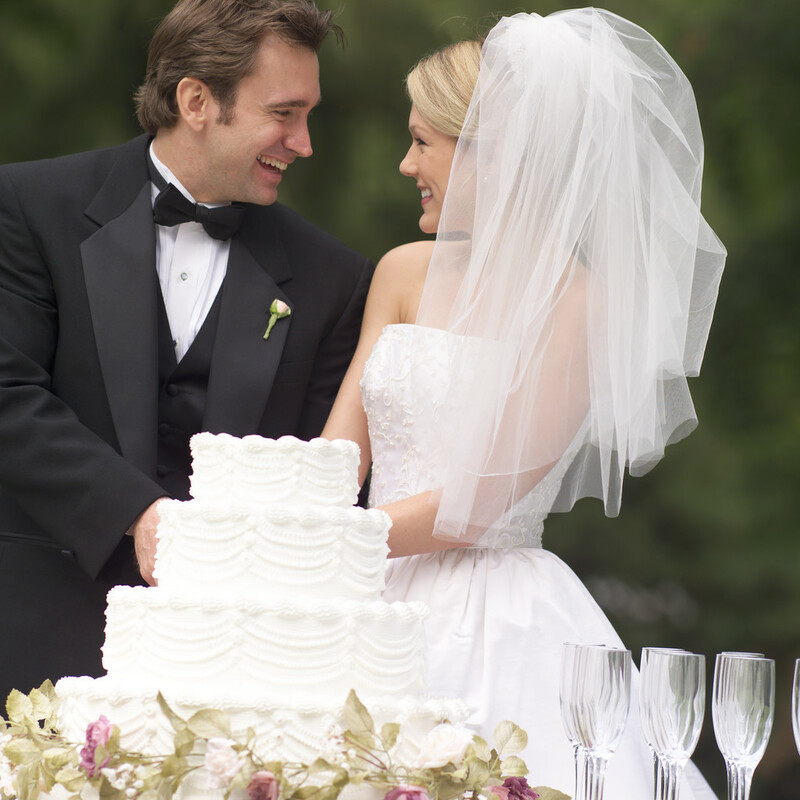 If we do not feel that this is a good fit for all parties, we will be happy to suggest another caterer or food solution that might work for you. 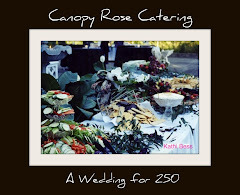 While Canopy Rose offers everything from parties-to-go that can be picked up at our beautiful facility in the historic district of downtown Havana, Florida to elaborate full-service events with professional serving staff, on site chef attendants, food stylists, event designers, etc. 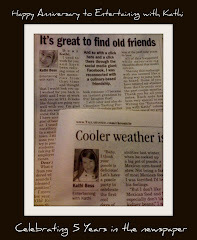 ... we are quite selective in the projects that we take on. 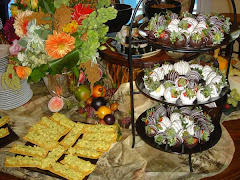 If you are shopping for a budget caterer and the bottom-line dollar amount is your primary concern please look elsewhere. You should be able to find some suitable solutions. 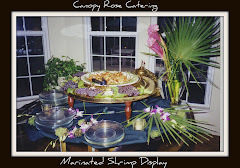 However; if you are shopping for exquisite quality, extensive experience, culinary excellence and artistry- Canopy Rose is the premier caterer in Florida's capital region and the surrounding North Florida, South Georgia and Gulf Coast beach and waterfront communities. For the ultimate .... may we suggest An evening of Culinary Entertainment? 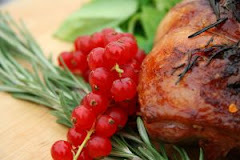 Culinary Entertainment is a hot, hot, hot trend! Think food show meets special event. 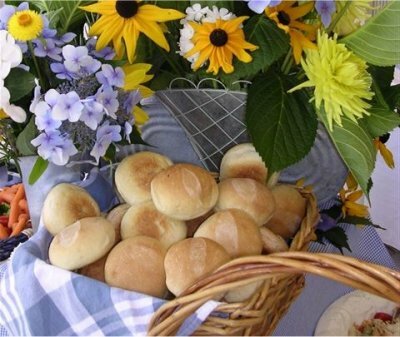 Your guests will go positively wild with the fun ideas cooked up by Florida food writer, caterer and special event designer Kathi Dameron. Now don't expect us to spill our secret strategies and intriguing ideas for free! 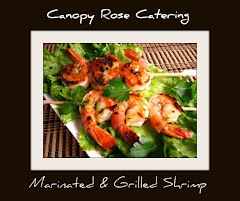 To see if your event could be a potential candidate for An Evening of Culinary Entertainment ~ contact Canopy Rose at 850-539-7750. 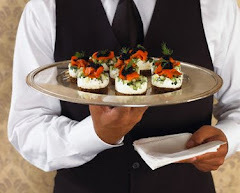 Culinary Entertainment requests should be placed at least three months prior to your event.